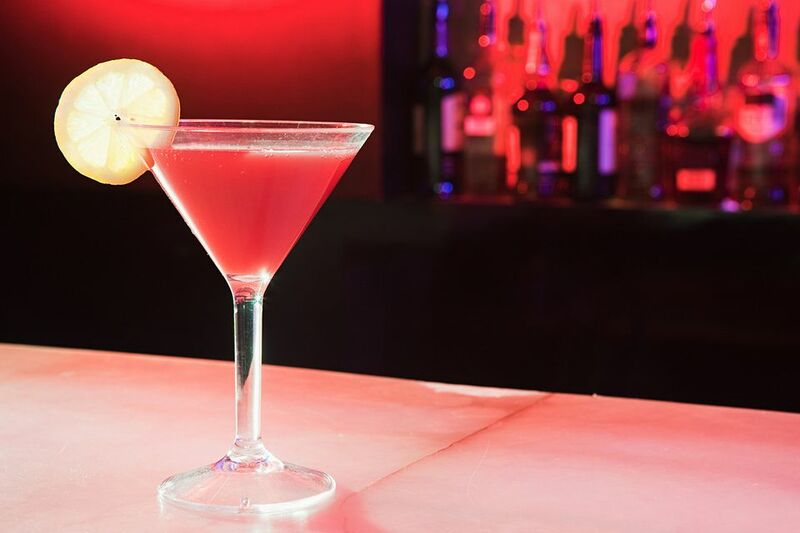 The blushing lady is a beautifully designed pink cocktail that is the right blend of tropical fruit flavors. The taste is amazing, it's easy to mix up, and it looks absolutely stunning when served in a sugar-rimmed glass. You'll find it to be a great cocktail for almost any occasion, including showers, weddings, and ladies' night out. Featuring Pama Pomegranate Liqueur, the flavor of a blushing lady is a medley of sweet and tart. It's a lively vodka martini that pairs the sweet liqueur with a punch of pink grapefruit juice. You may even find yourself so entranced by the taste, that you'll reach the "one too many" mark and end up blushing as pink as the drink. Rub a lemon wedge around the rim of a cocktail glass and dip the glass into a plate of sugar. Set it aside. In a cocktail shaker filled with ice, pour the vodka, pomegranate liqueur, and grapefruit juice. Though the recipe calls for pink grapefruit, the red variety of the citrus fruit will work just fine in this cocktail. Fresh grapefruit juice will definitely make a better tasting cocktail. The citrus is at its best during the winter months when it will be sweetest and offer the most juice. On average, a single grapefruit should yield between 5 and 6 ounces of juice, which is plenty for a few blushing lady cocktails. Generally, martinis are the place to show off your best vodka and that's great advice for this recipe as well. Since Pama does have such a strong presence in the drink and a bolder flavor, you can get away with a mid-shelf vodka if you want to save a little money. You'll barely notice the difference. Did you run out of Pama? Grenadine is a quick fix that offers the same pomegranate flavor. Since it is a syrup, it will be sweeter than the liqueur. When using it as a substitute, cut back to 1/2 ounce of grenadine and make up the difference with a little more vodka and juice. Try this recipe with a flavored vodka to add a little more dimension. Citrus, pineapple, and other tropical fruits are all really nice pairings for both pomegranate and grapefruit. You could even give cucumber or ginger vodka a shot! Switch out the vodka for blanco tequila or light rum if you prefer. It would also be a nice drink for the aged types of either spirit. If you swap the grapefruit juice out for an orange liqueur and change up the proportions slightly, you can make a delightful Pama martini. The two make a great pair to offer guests at the same party without significantly increasing the cost. When you're not in the mood for a martini, transform this mix into a tall, refreshing cocktail. Keep the vodka and Pama pours the same, double up on the grapefruit juice, fill your glass with ice, then top the drink off with club soda. How Strong Is a Blushing Lady? This blushing lady looks all sweet and innocent, but she's a feisty gal! While it's not the strongest martini you can mix up, the alcohol content will fall into the 22 percent ABV (44 proof) range.